"...a pattern had to be built and delivered to the lead keel foundry, Henry Irons in Cornwall some 388 miles distant. The shape was significantly more complex than anything seen in the 5.5 class before, and so the pattern took twice as long to make. Apart from superior hydrodynamics the designer was aiming to place the CG lower than conventional, which meant that a hollow stub keel had to be built into the hull..."
LoA 9,404m, Width 1,917m, L 7,80m, L1 7,337m, D 1,926m³, Weight 1975kg. 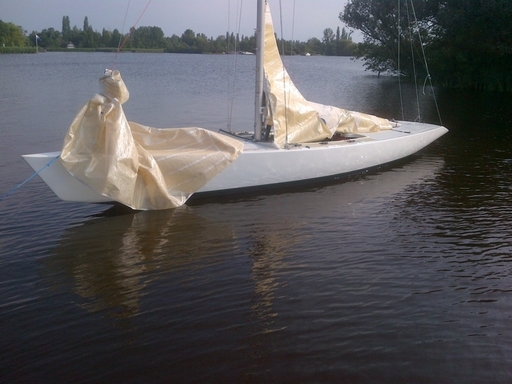 As far as research has brought up, this boat built for Jonathan Janson with a new Howlett designed hull, using the former GBR 38 deck, later became NED 15 and is still sailing today in The Netherlands.